A friend wants a batch of beer. He gave me an empty keg…only seems fair. Besides, any excuse to make a batch of beer! Ben is NOT adventurous when it comes to beer. He wants a higher alcohol, but not to much in the way of taste. He’s a bud/miller/coors type of drinker…so, I can’t venture too far from that. Now, I can’t really make a BMC clone…I just don’t have it in me. You might as well just buy a BMC as make one. 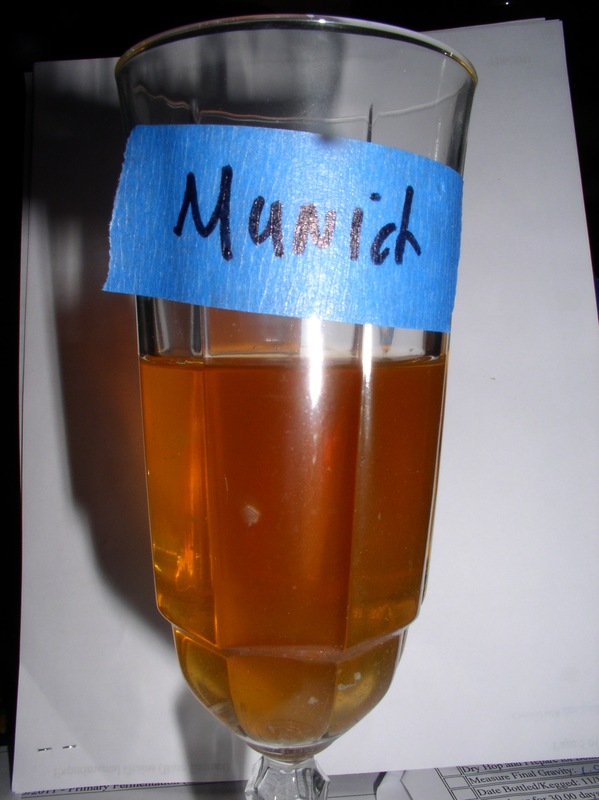 Its actually kinda difficult to make a beer similar to BMC—VERY low flavor, and moderate alcohol, and VERY light color. These are a little incompatible with each other, and require levels of process control that are 1) hard to achieve, 2) Not much fun…even if you CAN succeed. However, I owe it to Ben to stay somewhat true to his request. So, in the interest of staying “light” I lowered the grain-bill 9 1/2 lbs of grain. Mostly, US 2-row…with 16% Vienna to provide a touch of flavor “complexity”. US 2-row is almost as light in flavor as you can get (and color too). I added the vienna to provide just a touch of interest. It is also a fairly light grain, and I’m only using 1 1/2 lbs….but, it should be enough to have an impact. The malts should contribute an original gravity of 1.042 SG based on my usual efficiency. This is a moderately low OG, and should keep the flavor profile on the lighter side. To further keep the flavor on the lower side, I mashed at a low temperature. I mashed in at 150 (actually moderate)…but, stirring brought this down to 146 within the first 30 minutes, and finished at 144 after a total of 80 minutes of mashing. The early 150 should have allowed alpha-amylase time to break apart the starches into smaller pieces. Since this was only for the first 10 minutes or so, the beta-amylase would not have had time to denature. Stirring during the first 15 minutes brought the temp down below 148 which favors the beta. The prolonged mash below 148 (ending at 145) hopefully gave the beta sufficient time to make a highly fermentable wort with very little dextrin content. In order to provide the elevated alcohol I added simple table sugar to the boil: 2 1/4 lbs of it. If this were for myself, I would have used amber or dark candi sugar (inverted table sugar cooked to a medium or dark color). The darker sugar would have introduced some more carmel type flavors. But, again…Ben is boring. There’s a trick here…yeast are funny about table sugar (sucrose). Once yeast begin to consume sucrose they stop consuming maltose (the sugar from malted barley). However, if you boil sugar in water and acid (pH around 5-ish) the sucrose will separate (or invert) into glucose and fructose. Yeasts can consume these simple sugars without affecting their preference for maltose. Wort pH is low enough (5.4-ish) to invert the sucrose. The pH is higher than is ideal, but with a 60 minute boil there is also plenty of time for the slower reaction. Since, I didn’t want any carmelizing of the sugars this was sufficient for Ben’s beer. 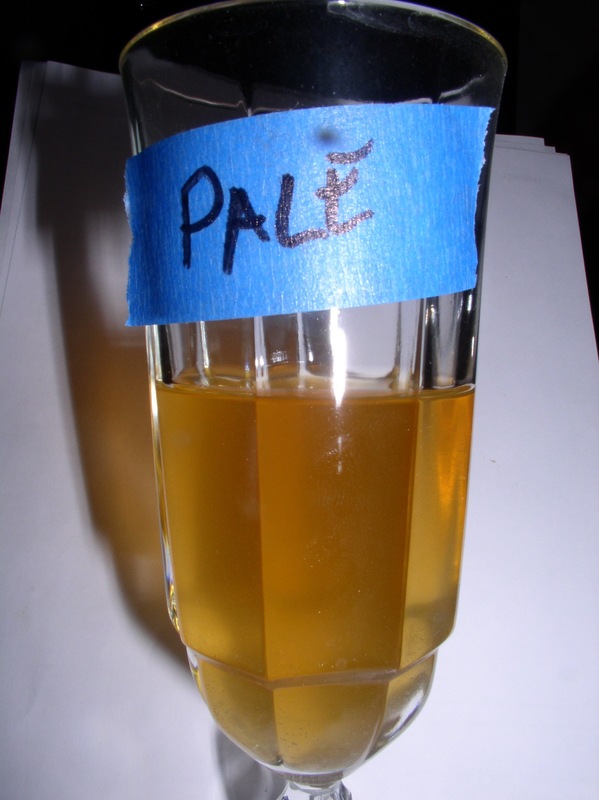 If (when) I make this beer again, I’ll switch to Amber invert sugar. This can be made on the stove-top by adding lemon juice and a little water to the sugar…cooking to the desired color. 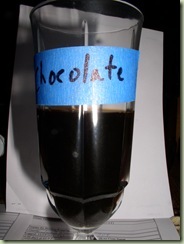 I may even try a “dark” candi-sugar variation. Candi-sugars are traditional ingredients in Belgian beers. I’ve never brewed with table sugar/candi-sugar. I’m only using my new brew kettle (the Keg that Ben gave me), for the second time. I got a pH meter for Christmas…so this is my first time to be able to measure and control the pH of my mash. I made a ‘hop spider” to contain my leaf hops in the boil. I didn’t used to need one, because my boil pot was small enough that I could lift it and pour the wort through a strainer. But, the new kettle is too big to do that with. So, the hop spider keeps the hops in a LARGE bag so that I can remove them from the wort at the end of the boil. I have a temperature controller that I can now use to control the fermentation temperature. The final two pieces to this puzzle is the fermentation. 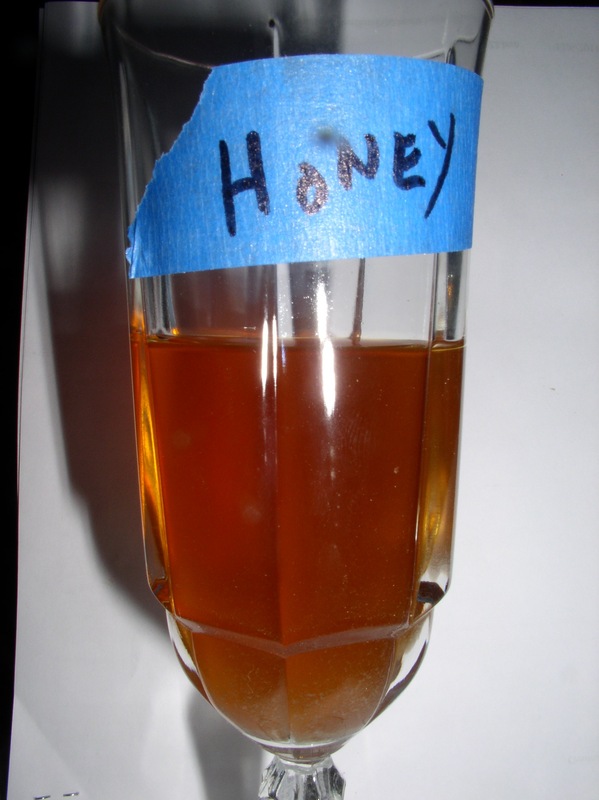 Humans don’t make beer….we make wort. Yeast make beer from the wort. 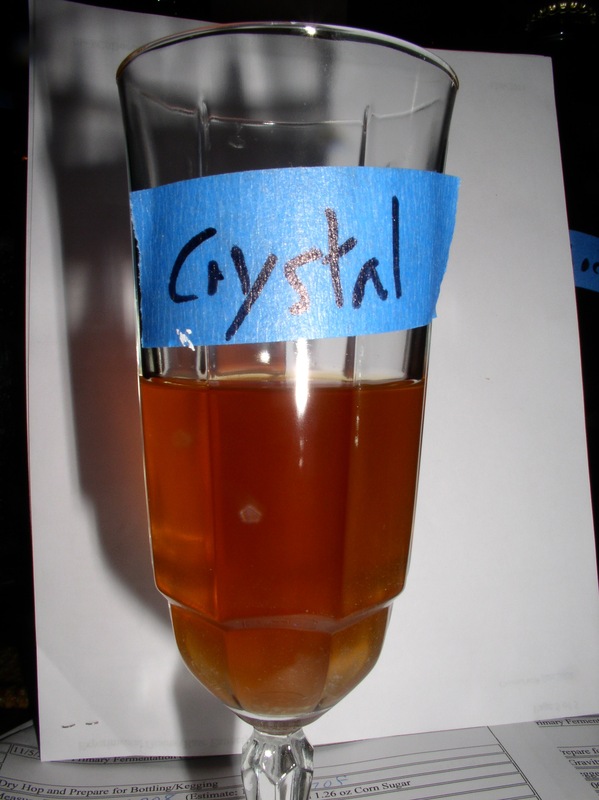 Our contribution to the beer making is controlling the temperature that the yeast work at. Yeast create a lot of flavors. 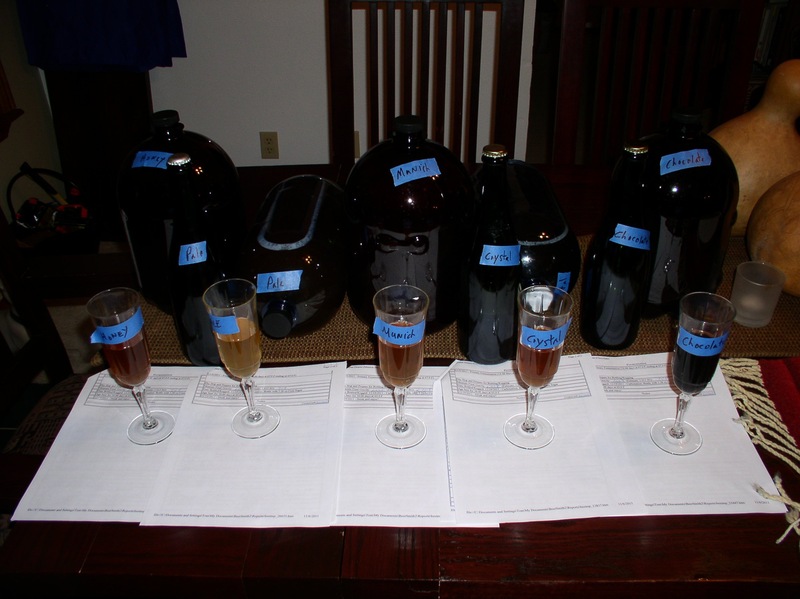 You can control this in two ways: 1) the yeast strain chosen to do the work, 2) the temperature of the fermentation. The higher the temperature, the more “flavor” they produce. The flavors they produce at higher temperatures are typically called “fruity”: apple, peach, pear, banana, etc. Keeping with the low flavor theme I’ve opted for a VERY low fermentation temp of 59-65 F.
I “grow” my own yeast. 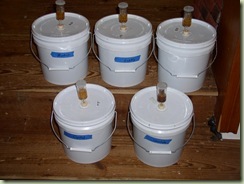 At the moment I only have room for two yeasts: english ale yeast, and American ale yeast. 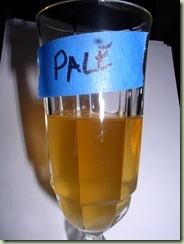 English ale is strong in unique flavors and American is known for its “cleanness”. Again, I elected the low flavor variant…American. The beer is 4 days into the fermentation. I tasted it 24 hours after I started it. I got a noticeable grapefruit taste. Not strong or overpowering, but noticeable. The flavors were very clean. I’m excited to see how this turns out. I left one batch plain for comparison. 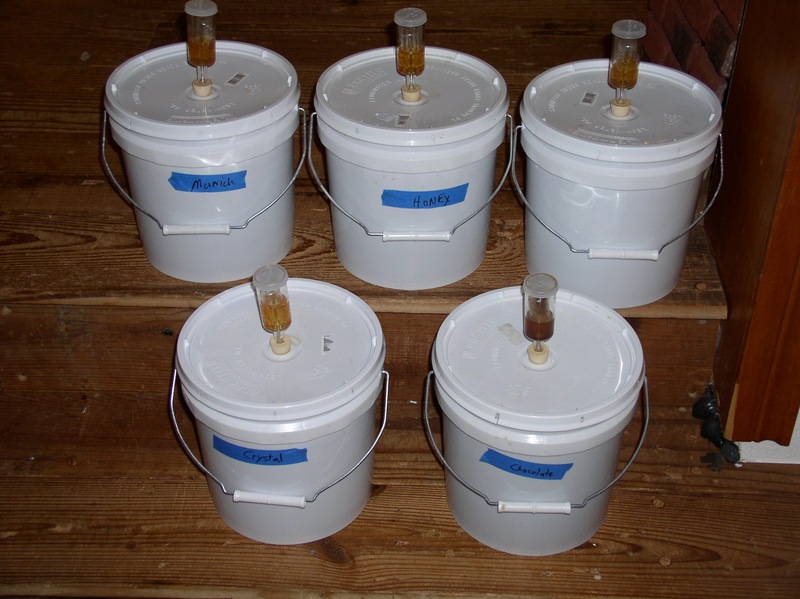 Below is a picture of all the little buckets, they’ve been fermenting in the beer/wine closet for a month, and are now ready to bottle up. So, I bottled them in 1 1/2 gallon plastic bottles—a system called tap-a-draft, perfect for taking to parties. 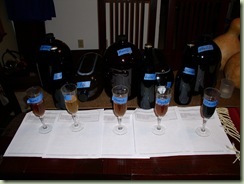 Then I took some samples and put them in clear champagne glasses. The Pale was surprisingly sweet. It fermented out quite well…so, I’m not really sure why it ended up tasting slightly sweet. 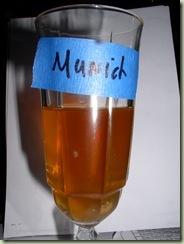 The Munich had a slight roasty flavor to it, and was much less sweet. The honey was also silghtly sweet and has the distinct aroma and flavor of honey. The interesting thing is that there is ZERO honey in honey malt. 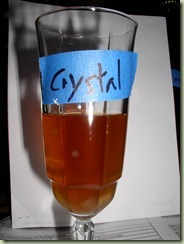 The Crystal is an odd carmel-y flavor, that I’m not really very fond of. It works much better to “round” out flavors in a beer than as the main flavor note. The chocolate had disctinct notes of chocolate and coffee with very little perceptible sweetness. Even though it was the “least fermented” of all 5. 2 years ago (today) I brewed a basic Robust Porter recipe. It was going to be the starting point for some attempts at toasting my own malts…in particular a smoked brown malt. After reading Ray Daniels descriptions of original porter, I’d decided I wanted to try and figure it out. Anyway, I’d made this batch of modern porter to set a few aside for comparison as I worked on the recipe. Long story, shorter….life happened and I ended up leaving the porter in the secondary for the last two years. I’m getting back into brewing now, and I just knew this beer was a goner. 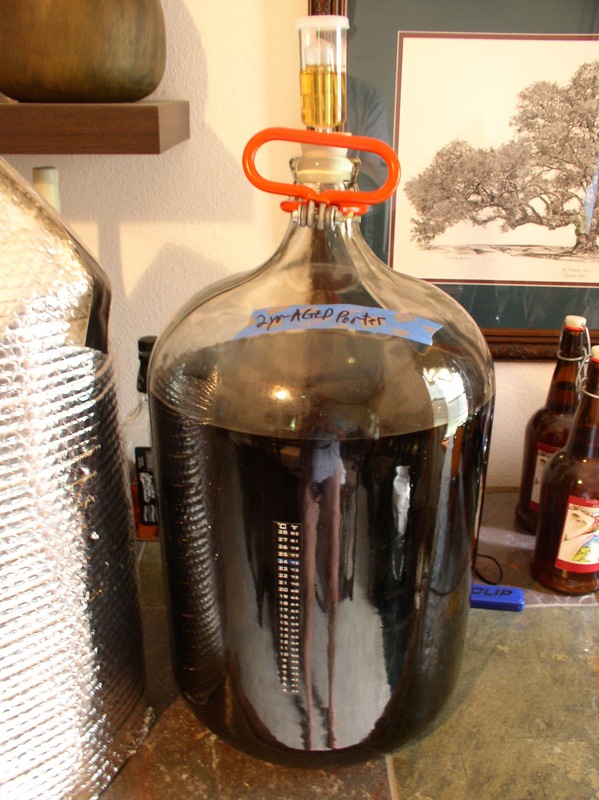 I just hadn’t gotten around to dumping the carboy. So, its porter season again…a couple weeks ago I brewed the same porter recipe…this time with the intent to split the batch into secondaries and add chocolate/vanilla to one, coffee to the other, and a small but un-doctored. 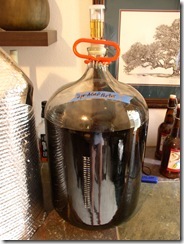 Last night I transferred the new porter into carboys with the secondary ingredients. While I had all the racking / cleaning equipment out, I figured it was a good time to finally get rid of the old Porter. Its been a while since I made a batch of beer! I decided to make a batch of basic Porter, today. I use BeerSmith (www.beersmith.com) 1.4 for my recipe design. 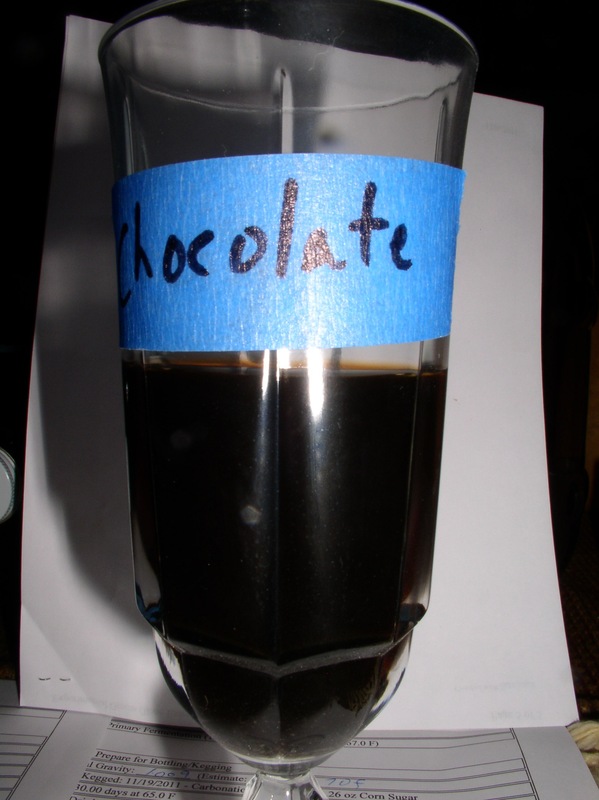 The recipe below is a pretty middle of the road modern Porter, just to get my feet wet again. Eventually, I want to start working on a more authentic Porter that is slightly more traditional. Porter was originally a beer that was made in massive quantities, and was actually used as sustenance by the working class.